Wilton's Dean Dinanno (1) celebrates a first half goal against New Canaan in a boys lacrosse game at Dunning Field on Tuesday, April 9, 2019 in New Canaan, Connecticut. NEW CANAAN — Talking about the key to the New Canaan boys lacrosse team’s 9-8 victory over the Wilton Warriors Tuesday night in a Top-10 showdown at Dunning Field, Quintin O’Connell offered one word in particular. It was a word well worth repeating. In a game which seesawed throughout the evening, No. 3 New Canaan came out on top when Liam Griffiths took a pass inside from Drew Guida and scored with 1:03 remaining, and the Ram defense held off a final shot by Wilton in the closing seconds. The win was New Canaan’s first of the season after a pair of losses road losses against Summitt, NJ, and St. Anthony’s, NY, and it came against the Rams’ oldest lacrosse rival. “It was awesome — a great team win,” Rams’ senior co-captain and defenseman George Dumbauld said. “You look at Chris Canet, a sophomore, was ripping his shots, and Timmy (Norton) at the faceoff X, they were battling it out. It was a close game and a good opponent, and in the end, it was all about team and we had our backs. While the Rams improved to 1-2, the Warriors — ranked 8th in the GameTimeCT poll — suffered their third straight loss and dropped to 1-3. All three losses have been by one goal and the last two were both 7-6 in overtime to John Jay, NY, and Greenwich. The score was tied at the end of the first three quarters — 3-3 after one, 5-5 at halftime, and 7-7 after three. The biggest lead was two when New Canaan led 5-3 in the second quarter, but the Warriors raced back to take a one-goal lead twice in the third. The winning goal came at the end of a sustained possession for the Rams, with O’Connell battling Wilton defenseman Ryan Schriber to try and get in position for a shot. With nothing open, O’Connell was able to get a pass off to Guida on the far side, and Guida fed it back in front to Griffiths for the goal. Still, the Warriors had possession in the final minute, but were unable to get a clean look at the goal. A final shot by Reilly Sullivan was clipped by New Canaan long pole Jack Finnigan as the clock ran out. Norton provided one of the keys to the game for the Rams, as he was brilliant at the faceoff X during the fourth quarter. “It was kind of stressful, but the pole really did his job and I was really confident with my wings,” Norton said. “So if anything happened, I wasn’t too worried about the ball being on the floor because they’ve always got my back. The whole faceoff was a team effort. Both goalies were on point as well, as Wilton’s Andrew Calabrese made 20 saves, and New Canaan’s Carl Mazabras had 15 stops. Canet, the sophomore, led the Rams’ scoring with a hat trick, Griffiths scored twice, and Will Rechtermann had a goal and two assists. Norton, Teddy Manges and Callum Wood also scored. 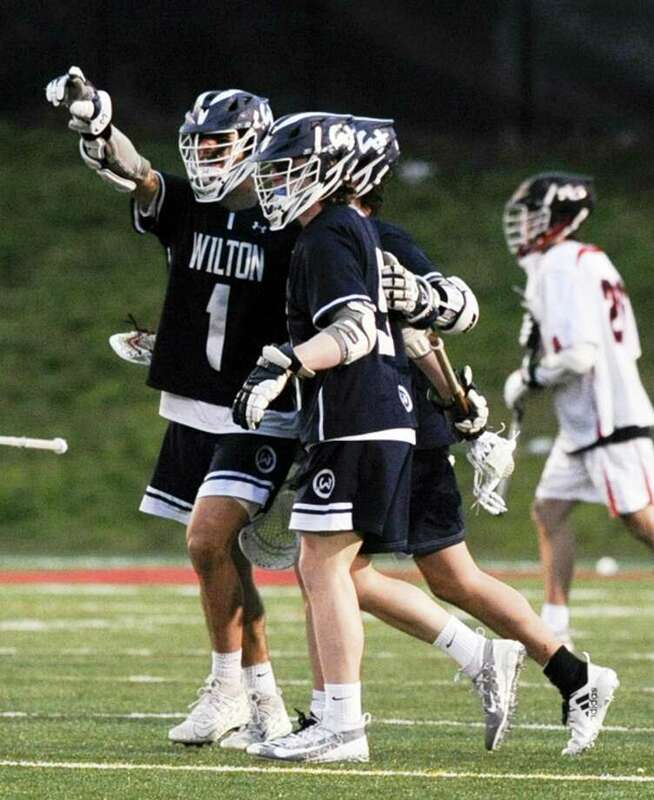 DiNanno had three goals and one assist for Wilton, with Jack Savarese adding two goals, and Sullivan, Andrew Luciano and Ryan Kauffman each scoring once. “That was a great opponent — nothing but respect for them,” O’’Connell said. “But we’re proud of each other and we’re confident in each other and that’s all you can ask for in a team. Tim Norton, New Canaan. The Rams have depth at the faceoff X and that was on display Tuesday night with Norton coming up huge down the stretch. Norton scored a goal early in the game, and put New Canaan in position to win it late.